So, was anyone else a little over-zealous in their blueberry picking last summer, only to find that their freezer runneth over now, in April? It's hard to fathom having too much of such a good thing, but yesterday I discovered the last of my hard-earned berries teetering perilously close to freezer burn. I had to use them ASAP, but I wasn't in the mood for muffins, or pancakes, or scones, and the idea of throwing them into a smoothie seemed like sacrilege. That's when I thought of clafoutis. 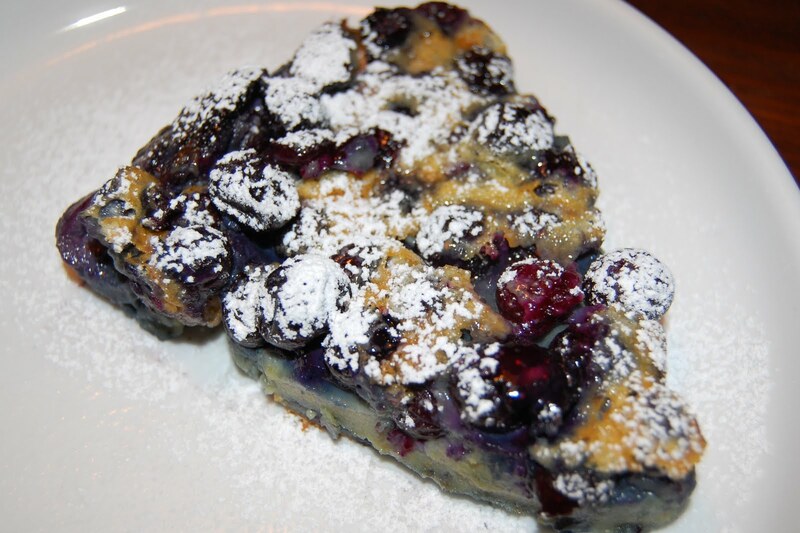 Clafoutis (kla-foo-tee), a rustic fruit dessert originated in central France, is usually described as a cross between a custard and a cake. 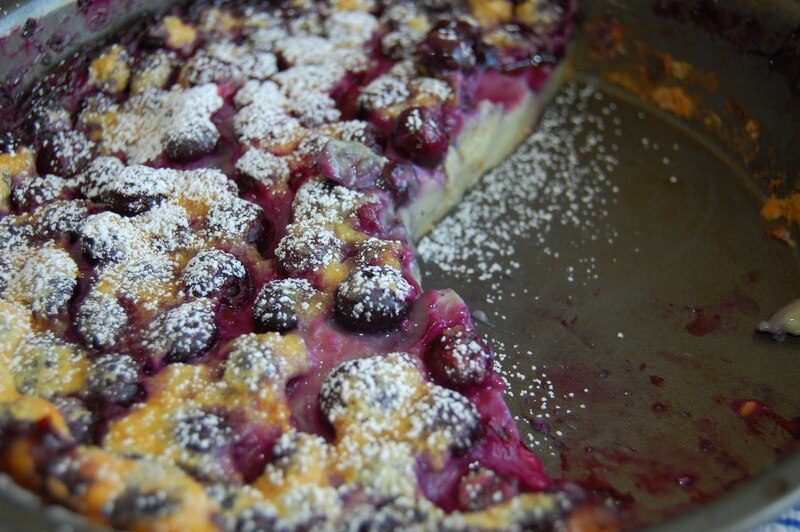 Authentic clafoutis is made with cherries, but it adapts well to other fruits such as prunes, plums, berries and pears. I haven't baked clafoutis for many years, so I scoured my cookbooks and the internet to compare recipes. In the end, I avoided the more embellished iterations and settled on an appropriately simple one by Christopher Kimball that I tweaked only slightly. First, since I got it in my head I wanted a breakfast clafoutis, I reduced the sugar slightly (to 1/4 cup) with good results. 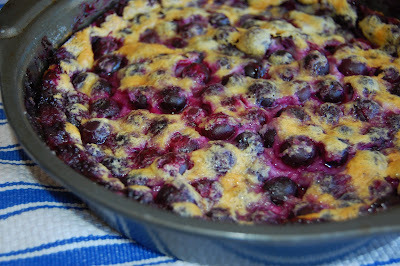 If you're serving the clafoutis for dessert or your berries are on the tart side, I would use 1/3 cup sugar, as written. Also, I added a smidgen of almond extract and some lemon zest to complement the berries. Finally, I simplified things by mixing the batter in a blender, as is often done with clafoutis. While the frozen berries seemed to work fine in this recipe, I'm sure fresh would be even better if you're willing to hold off a few months! If you're a custard lover and appreciate uncomplicated fruit desserts, chances are good you'll like clafoutis. Preheat oven to 350 degrees F. Grease a 9 inch round cake or pie pan with butter; dust bottom and sides with 1 tablespoon sugar. Place blueberries in an even layer in bottom of pan. Combine eggs, milk, sugar, flour, salt, vanilla, almond extract and lemon zest in blender; process until smooth. Carefully and slowly pour batter over blueberries in pan. Try not to disrupt the berries too much. Bake 40 - 50 minutes, or until clafoutis is puffed, golden brown and firm to the touch. 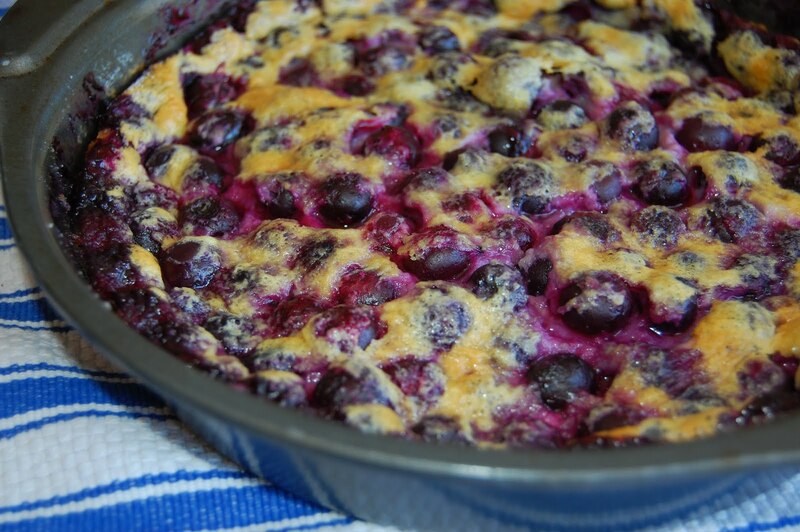 Allow to cool 15 - 20 minutes (clafoutis will deflate and firm up as it sits, making it much easier to slice cleanly). Dust the top with confectioner's sugar and serve warm. *If you'd rather skip the almond extract and lemon zest, use 1 1/2 teaspoons vanilla; or, at least use the lemon zest - it's really good. *Don't even try to slice the clafoutis before it has had a chance to settle; you'll end up with a gloppy mess! Blueberry Clafouti where have you been all my life? We had a bumper crop of Blueberries last summer and the freezer tells the tale. 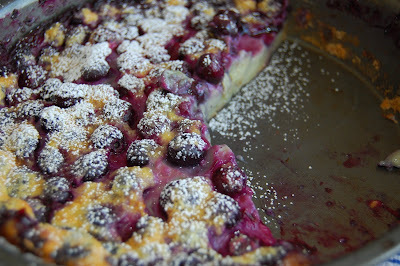 Made the clafouti for breakfast yesterday and had it for lunch and after dinner. I love custard, I love fruit and I adore this recipe (so simple). Blueberries and lemon zest, a match made in heaven. Ha! 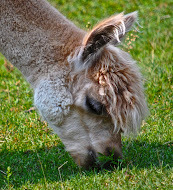 I did the same thing - ate some at every meal until it was gone. So glad you liked it as much as we did. Thanks for commenting! I wish there was some already made that I could eat right now! The spirit of life must be owned by everyone.